Who says a parade has to be held on land? 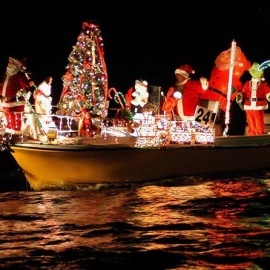 Every holiday season, communities throughout Pinellas County take advantage of their beachside settings and hold holiday boat parades. Sailboats and motorboats decorated with lights, trees, Santas, reindeer, candy canes, and anything else the owners can think of line up and cruise the waterfronts for the onlooking crowds. 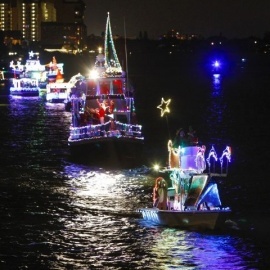 If you'd like to see one of these uniquely Florida traditions, here are some of the best-known holiday boat parades in Pinellas County. 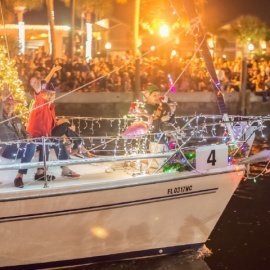 The 27th annual edition of the Tarpon Springs Boat Parade takes place Friday, December 1st, right after Snow Place like Tarpon Springs. 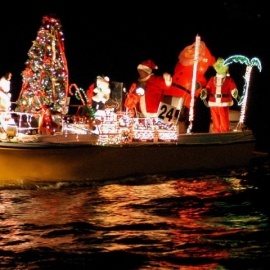 Boats leave from downtown Tarpon Springs around 8:00 p.m. and head down the Anclote River, toward Spring Bayou where Santa will give out holiday treats for the kids. (That makes Craig Park an ideal spot to watch the parade.) If you'd like to add your boat to the parade, download this registration form, or stop by the City Marina or the city's Recreation Division office to register in person. This year's Pass-a-Grille parade takes place Saturday, December 2nd, beginning at 5:00 p.m. The parade starts and ends at Merry Pier, looping around Pass-a-Grille Channel and Vina Del Mar Island. There will be a visit from Santa, caroling, and burgers and hot dogs prepared by St. Pete firemen. There's still time to register and enter your own boat in the parade! 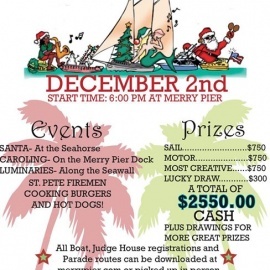 A captain's meeting will be held Thursday, November 30 at Merry Pier, beginning at 6:30 p.m. Prizes of up to $750 are available for the best-decorated boats! The 2017 St. Pete Beach Boat Parade will be Friday, December 8th, starting at 6:00 p.m. Boats start at Blind Pass Marina, next to Sea Hags Bar & Grill. The parade then works its way around the coasts of South Pasadena, Three Palms Point, and Brightwater before wrapping up at the south end of Belle Vista. Best spots for viewing include the St. Pete Beach Community Center and the adjacent Horan Park. There's still time to get into this parade as well! A captain's meeting takes place Tuesday, December 5th at the St. Pete Beach Community Center. The top boat wins a $2,500 cash prize and a week for two at the Jamaican On The Gulf! Register using this form. The oldest parade on our list dates to 1967. This year's edition will be held Saturday, December 9th, beginning at 6:30 p.m. The route of the parade has been reversed from past years -- it now begins at the American Legion Post 273, then goes around each and every peninsula and inlet in the town before concluding at Johns Pass Village & Boardwalk between 9:30 and 10:00 p.m. The best viewing is at ROC Park, or at the parade's end if you can wait it out. For boaters who want to sail or motor their way through the parade, here's a registration form. 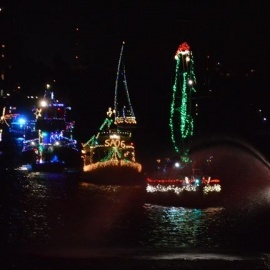 The 31st annual St. Petersburg Illuminated Boat Parade is Saturday, December 9th starting at 6:30 p.m. This year's parade launches from near North Straub Park, with Vinoy Park, Albert Whitted Park, and Spa Beach Park among the best places to watch. Don't want to scramble for a spot to view this year's parade? You can reserve grandstand seating for $10. Food, beverages, and a performance from the Southside Bulldog Band will also keep you entertained. All proceeds from this parade benefit the Rotary Club of St. Petersburg. The city calls this parade "like Las Vegas on the water," and it's traditionally the largest holiday boat parade in Pinellas County. It launches Friday, December 15th at 6:20 p.m. from The Club at Treasure Island. It circles Paradise Island and passes by Yacht Club Estates, then goes under the Treasure Island Causeway and around Isle of Palms and Isle of Capri. The parade wraps up at John's Pass, near Gators Cafe and Saloon. The Treasure Island Causeway bridge closes to vehicle traffic for about 45 minutes during the parade, making it a great place to watch the passing boats. Other prime viewing spots include Kingfish Drive near John's Pass, Blind Pass Bridge, and 115th Avenue on Isle of Palms. These are the most popular Christmas parades in Pinellas County, but there are other holiday boat parades out there too. Wherever you decide to go, you're sure to enjoy a spectacle you just can't get anywhere near the North Pole. And be sure to check out the rest of our Christmas content on 727area. You can register and be notified about all of it!